If you’re reading this, you are likely coming to terms with something terrible on the horizon: the death of your loved one. It may be moments, days or farther away. I won’t mince words. It is hard, hard, hard. You may be “driven” during this time — partly to be effective, to lessen pain or anxiety for your loved one (LO), to assuage guilt you may feel, or just to stay busy to keep your mind off what is to come. Every experience is different. So I’ll just speak of my own, in the hope it will help in yours. I think it just might. One thing that helped me was to write. I scribbled down things I wanted to say. Important things. Whimsical ones. Remembrances. Especially the things I wanted to repeat, emphasize, and reinforce. So I wouldn’t forget to say them. You may find yourself at a loss for words. I didn’t want to. Preparing helped me to accomplish several things. To ensure that I actually said all I really wanted to, providing comfort with the things that would mean the most to my loved one, and to provide me with something to say when the ability to come up with words spontaneously fails in the tsunami of emotion that overwhelmed me at times, as the hard-fought victories of life with Lewy were being stripped away relentlessly. Having things written down allowed me to remain focused, to wholly relive the sublime moments of a recollection, sharing it with that person with whom those memories were formed. Writing this article now, months after my mother died, is still very difficult, but I have also gone back to those point-form notes, and they bring me solace — reliving some of them in a different context, but also knowing that her soul departed amidst images of green grass, beautiful skies, of trees, picnics, sunday dinners, dearly beloved places, of funny moments shared, reminders of old friends and family, assured that her parents would welcome her, her siblings await her, what a difference she made, the wonderful and everlasting legacy she had created, and that I appreciated and loved her for the life she gave me. What would you want to hear if you were on your way out? Think about it now. And write a few things down in case things change unexpectedly, and so you can reflect upon what is meaningful. Your Voice Connects You Both, Even if It’s Just You Speaking. Voice is the very essence of our ability to connect and bond. We get comfort from it. And the voices of those we care for are comforting in themselves. Even the physical vibration of each person’s voice is unique, and can be felt as well as heard, and brings comfort. That is something I feel should not be missed. There will be plenty of time for silence as well. My mom was utterly unresponsive outwardly on her last day: the Intensive Care Unit (ICU) staff said she was “in a coma.” But I still believe that, deep within, there was a part of her that could comprehend, and to that part I continued to speak. I didn’t wait until the last moment, either. We had spent countless hours and days together in the preceding years. And I was in Emergency and the ICU for the entire time apart from having to sleep — so I had plenty of opportunities to reminisce while she was still able to connect, although completely unable to move, or make a sound. Her eyes would zero in on mine periodically, and I am utterly certain she heard and understood. They are the windows of the soul. One of the last things she did while conscious was lock eyes with my then-95-year-old father, as he tried to balance on the only leg he has, unsteadily leaning over her, telling her how much he loved her, that he’d see her again, and repeating tales of how they met, how they lived, how much he missed her, and how — more than anything — he wanted her back home with him. It was heart breaking, and heart making. I am absolutely certain this was an enormous comfort to her. So make a list of what you want to say. Keep it easy to access so you can add to it and refine it. Say some of it, or all of it — whenever you can. The appalling worries and unrelenting sadness that accompany the time leading up to death can be a silent one, and having thought this through may make it more of a celebration amidst the rushing stillness. This is something that would not have occurred to me, but I will certainly give it some thought. So many things aren’t considered ’til too late. 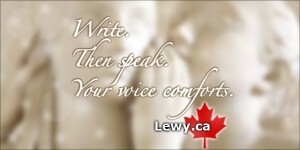 Lewy robs us of so many things, and this was one I was glad to have the time to prepare and act upon. Considering anything at a time like this is hard, Fern, but considering it at all shows your compassion and exceptional character. Strength to you! Timothy Hudson. Being able to talk to your loved one at the eleventh hour is freeing. And don’t be afraid of laughter. I have sat with family members during eleventh hour and coached them to elicit humorous anecdotes about their loved one. The family often seemed to experience joy in remembering those sorts of stories and it seemed to lessen the stress. You can always assume that the dying person is very much there even if they appear to be non-responsive. That is so wise, Marianne. Too often forgotten in the great sadness that accompanies that time, and some think it’s inappropriate to laugh at times like these. I completely agree with you, and am sure that those light moments lighten the mood of our loved ones as well, whether they can respond or not. Rock on, superhero! A great point! Thanks you so much. I have prepared so much already but making that list of things to say to my loved one is a brilliant idea. Thank you for your note, and kind words. I am so sorry you are having to do any of this preparation, but hope that this will allow you to ensure you say everything you want to. I tried to ensure that I’d always said everything I wanted to, as early as possible, in case I was unable to say it later, or if I believed she would be unable to understand what I was saying. In later phases, I do not believe comprehension is always impossible, but the ability to respond is definitely compromised. > The thought and effort you put into planning and making the Lewy Body Dementia journey the best it possibly can be for your loved one shows your dedication, compassion and love. > Strength to you! Timothy Hudson.